It’s finally cooling down in the desert regions of Arizona (Phoenix and Tucson areas). So when you are out hiking, you cannot miss the cacti towering over you about 10+ feet. Many of you may be familiar with the Saguaro Cactus, whether you know it or not. If you are not sure, think of the image of the green, tall, thick tree-like thing you see in every Wile E. Coyote/Roadrunner cartoon. Or, you practically see it on anything that depicts the southwestern United States. 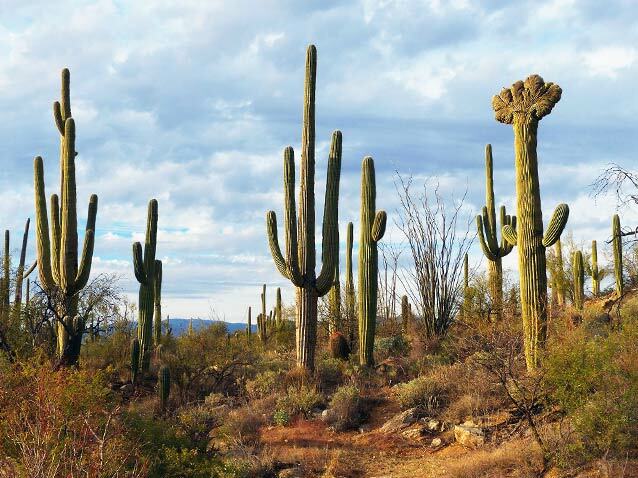 But the fact is, the Saguaro Cactus is not deserving of a southwestern icon since its territory is limited to the Sonoran Desert in Arizona and Mexico. These cacti are so unique that Arizona visitors always have many questions about these amazing feats of Mother Nature. Here are a few courtesy of Saguaro: The Desert Giant by Anna Humphreys and Susan Lowell. Only in the Sonoran Desert or southwestern and south-central Arizona and western Sonora, with a very few in southern California. How tall do Saguaros grow? Record height is 78 feet with an average mature height of 18-30 feet and often with heights of 50 to 60 feet. How much do Saguaros weigh? About 80 pounds per foot. Or, a lot! Not very. Depending on the location and age of the plant, they average about 3 feet in thirty years. When do they grow arms? At about 12 feet in height or 40 to 80 years. Some never grow arms. What are they mostly made of? Water. But this does not mean you can cut one open to access your own oasis. The water is absorbed into a pulpy material, making the sap slimy, bad tasting and difficult to extract. Estimates are up to 200 years. Not currently, however, they are protected. Under the Arizona Native Plant Law, the saguaro is listed as a “salvage-restricted protected native plant,’ meaning, they are considered vulnerable to damage by theft or vandalism and are protected by law. They cannot be legally removed from any lands, without a permit from the Arizona Department of Agriculture. A saguaro can be legally obtained with a permit and then it is issued an official seal. Suspected poachers, traffickers and vandals can find themselves in a legal and financial bind with Class 4, 5 or 6 felonies and fines as high as $100,000 for transporting saguaros illegally across state lines. Just some info in case you were interested in starting a career in Saguaro Trafficking. Why do Saguaros have ridges? Like Ruffles brand potato chips – so the dip doesn’t fall off as easy. Actually, there are three reasons. The first is to allow for expansion when collecting and storing water after rain – since the desert gets so little, it has to be able to store the water some where. Second, as you may notice from the above picture, the Saguaro does tower above other plants, but it does need some sort of protection from the sun. The accordion pleated ribs allow the cactus to produce its own shade – it’s not much, but all it needs. Finally, the ridges act like a wind breaker. The desert can see winds of 70 plus MPH certain times of year. Since the Saguaro is the tallest plant in the desert, sometimes with no mountains to break the wind, one would think it would blow over. Yet, the pleats break the winds up, keeping the cactus tall and strong. If you ever stand by one during a heavy wind, you can hear the wind as it blows around the ridges. Hopefully this satisfies your thirst for saguaro knowledge – for now. And now that the weather is perfect to go out and greet a few – maybe with a hug (not really because that would hurt). Want more amazing tidbits of information about Arizona? Check out our blog and get some first hand experience! 13 Facts About The Saguaro Cactus. It’s pronounced “suh-gwahr-oh.” 🙂 The word “Saguaro” has its roots in Native American culture, though there is no specific known meaning for the word it is speculated to be from the Yaqui tribe.